There is a concern and perhaps even an assumption among many that older drivers are more dangerous on the roads than younger drivers – and that senior citizens are high risk behind the wheel. This is both true, and not true, according to statistics. Senior citizens over the age of 65 years are not automatically to be considered as a danger when driving a motor vehicle; however, data does support the idea that drivers over the age of 80 years old may be more prone to accidents and injuries while driving. Americans aged 65 and older account for 13 percent of the total population. This group increased by two percent each year between 2001 and 2009. Over the next 15 years, the population of Americans 65 and older is projected to grow by 60 percent. Thirty-four million licensed drivers in the U.S. are 65 or older. Currently, 16 percent of the licensed drivers in the U.S. are 65 or older, up from 14 percent in 2000. Projections show that one in every five drivers will be 65 or older by 2025. Older men drive more than women of the same age, although the gap is narrowing. While 89 percent of men 65 and older continue to drive, only 73 percent of women in the same age group drive. Because they outnumber men, there are more 65 and older female drivers than men. Motor vehicle crashes account for less than 11 percent of fatalities among people 70 and older; heart disease and cancer are the leading causes of death. People ages 70 and older are less likely to be licensed to drive compared with younger people, and drivers 70 and older also drive fewer miles. 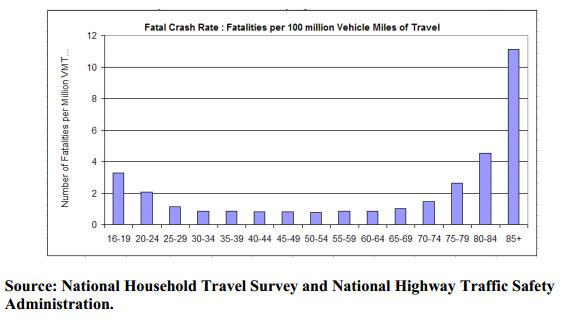 Per mile traveled, fatal crash rates increase starting at age 75 and increase markedly after age 80. This is largely due to increased susceptibility to injury, particularly chest injuries, and medical complications among older drivers rather than an increased tendency to get into crashes. Fragility begins to increase at ages 60-64. At age 75, older drivers begin to be markedly over-involved in crashes, but fragility is the predominant factor explaining the elevated deaths per mile traveled among older drivers. In 2009 motor vehicle crash deaths per capita among males and females began to increase markedly starting at ages 75-79. Across all age groups males had substantially higher death rates than females. Based on travel data collected between April 2001 and March 2002, the rate of passenger vehicle fatal crash involvements per 100 million miles traveled was higher for drivers 80 and older than for drivers of any other age group except teenagers. Drivers 85 and older had the highest rate of fatal crash involvement. Among passenger vehicle drivers involved in fatal crashes in 2009, the proportion in multiple-vehicle crashes at intersections increased as driver age increased starting at ages 70-74. Multiple-vehicle crashes at intersections accounted for 39 percent of fatal crash involvements among drivers 80 and older. According to the TRIP Report, Florida has 2,744, 378 licensed drivers who are over the age of 65 years old (as of February 2012). Ninety percent (90%) of these drivers are driving their own vehicle (car, truck, SUV) and most are driving during the daytime hours to do routine errands and shopping trips. Unlike some other states (like Ohio, for example), Florida has special driver’s license requirements for elder drivers. According to Florida Statutes, drivers that are over the age of eighty (80) must get their license renewed every six (6) years (for others it is an eight (8) year requirement) and these elder drivers must pass a vision test in order to keep their Florida Driver’s License. Research shows that Florida has seen more traffic fatalities involving drivers over the age of 65 years than any other state in the country, with 503 traffic fatalities in accidents where one vehicle was driven by a senior citizen of 65 years or older. The next highest tally was in Texas, at 397. 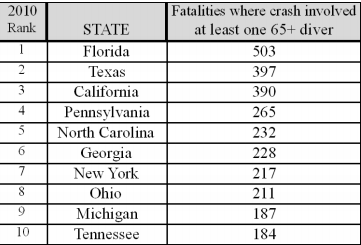 Florida also leads the nation in the number of drivers over the age of 65 who have died in traffic accidents (using 2010 data). Two hundred seventy-one (271) drivers died in Florida car crashes in 2010 who were over the age of 65.